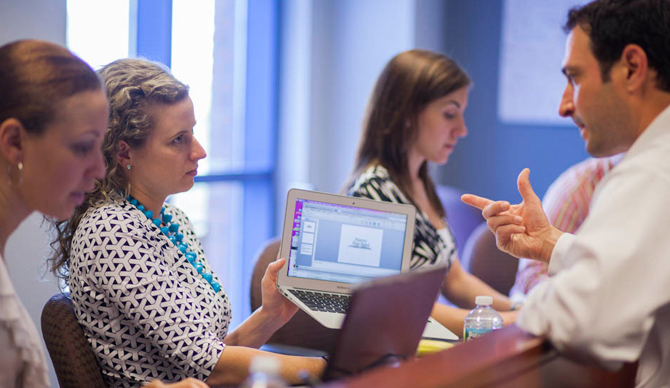 In June, 85 Drexel MBA students gathered for a live consulting project residency. Students competed as consulting firms vying for the opportunity to be awarded a full consulting contract for the not-for-profit (NFP) organization American Historical Theatre/History First Hand. In June, 85 Drexel MBA students gathered for a live consulting project residency. The students competed as consulting firms vying for the opportunity to be awarded a full consulting contract for the not-for-profit (NFP) organization American Historical Theatre/History First Hand. With this experiential education exercise, students had the opportunity to use their core MBA courses but also allowed them to gain a working knowledge of non-profit/not-for-profit entities. The students had to align quickly and get their strategies and standards established to create an RFP. This largest-ever for LeBow MBA residency was taught by Drexel LeBow MBA alumni Matt Kletzli, Suresh Chandran and Steve Berens. “This midpoint residency was a wonderful experience for our cohorted MBA students as it presented them with a real life not-for-profit consulting project in which their recommendations and contributions would impact the organization immediately,” said Samantha Ortiz, program manager for Drexel’s online MBA programs. “This project introduced our MBA students to a new experience as it differed from profit driven operations that are the typical focus of study in business. The professors were engaging and knowledgeable and the students were able to apply their MBA skill set and work collaboratively on teams as true consultants,” Ortiz said. The residency also provided a great networking opportunity for students across different program delivery options to connect with each other. Thirty-six students conducted market research and investigated promotion strategies and retail placement opportunities for Project HOME’s Social Enterprise projects.